The rather unsatisfactory term “outsider artist” seems to imply an isolated, rural or institutionalized setting as a prerequisite for the authentically gifted untrained artist. Thomas Burleson’s life and art somewhat contradict this model. Though troubled by emotional instability and prone to anti-social behavior, he raised a family and held a responsible job in the booming post-War suburbs of the San Francisco Bay Area. At night, in private, he created extraordinarily inventive and beautiful drawings that combine imagery derived from his factory job with possible references to his interior state. Thomas Burleson was born in 1914 in Waxahachie, Texas, near Dallas. He dropped out of a small local college to become a minor-league baseball player, and worked as a soda jerk and at other odd jobs off season. During games he was known to climb up into the bleachers and physically attack hecklers, an early sign of the antisocial behavior that would grow more marked with time. Around 1940 he married Joyce Greer, an elementary school teacher, and they eventually had three children. During World War Two Burleson served on a Navy minesweeper in the South Pacific until he was dismissed for malaria and for emotional instability—suffering from claustrophobia in his bunk, he’d attacked an officer who accused him of leaving his post. In the ’50s he worked as a shipping inspector at Bell Helicopter in Fort Worth, then moved with his family to San Jose, California, where he was a shipping inspector for Lockheed Missile and Space Company from 1959 until he retired in 1977. Burleson later returned to Texas and died in Fort Worth in 1997. Burleson referred to himself as a “doodler” and began to make small, cartoony drawings at least as early as the 1940s. His more sustained and serious artistic endeavors started sometime in the mid 1960s, after he arranged to be transferred to the night shift at Lockheed, which he did “in order to avoid being with his kids” (according to his son, Bill Burleson). During the long, quiet nights at the factory, Burleson began making drawings on paper that he found lying about: small (6 x 4 inch) memo pad paper, three-ring notebook paper, the backs of inventory forms—in one case a large pink discrepancy tag. 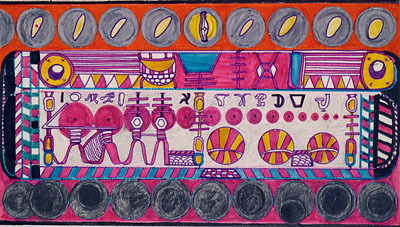 The earliest dated works are from 1967. After he retired from Lockheed he kept to his nocturnal schedule and stayed up alone at night drawing. Apart from some early works in pencil, he drew in ink with commercial colored marking pens, on paper never larger than what could be easily worked on at a desk or drawing board. Burleson did not seem to have any particular interest in art until he began to make it himself, but neither was it an entirely alien activity. Joyce Burleson had minored in art in college, and though she had mostly stopped making art after her marriage, a few of her works hung in their home, as well as paintings by her mother and sister. Suffering from agoraphobia, Burleson sought to have as little human contact as possible, and after he retired he seldom left the house, sending his wife out to get his pens and paper. 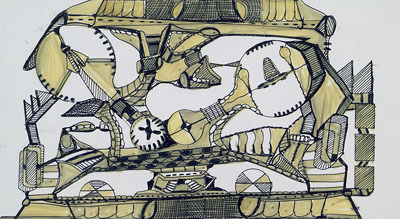 Joyce supported her husband’s strange, obsessive drawing and would frame and hang his work from time to time. Otherwise, Burleson’s art-making was a private activity, something he did in retreat from his family, to whom he became an increasingly remote, sometimes abusive and alcoholic figure. After his death, Bill Burleson, who had come to recognize the quality of his father’s drawings, contacted Luise Ross Gallery in New York, known for showing outsider artists such as Adolf Wölfli, Bill Traylor and Minnie Evans, but also mainstream artists. Ross organized Burleson’s first solo exhibition at her gallery in 2007. A second show was held in the summer of 2008. Even in the earliest, pencil, drawings, Burleson’s touch is assured and expressive. His pictorial range was limited for the most part to what he could draw well—that is, machinery, patterns, abstract shapes, walls and other architectural structures—which he combined into fantastically dense and inventive capricci. 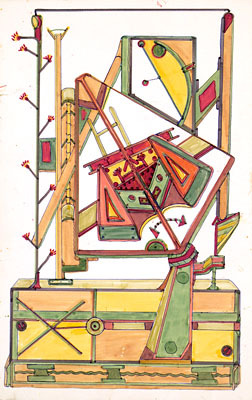 Imagery in the earliest drawings is mostly derived from his workaday life in the aircraft factory, but transformed into mad and spatially ambiguous machines that seem to combine elements of Rube Goldberg, Dr. Seuss and M. C. Escher. Conveyer belts, fans, propellers, wheels, gears, joined and segmented pipes, springs, coils, valves, pistons, ramps, and rivets, are joined with other, unidentifiable machine parts in fantastic, precisely-drawn constructs. Scientific and science-fiction elements encountered in the work, such as dials, telescopes, astrolabes and robotic figures, are reminders that during the period Burleson worked there, Lockheed was a leading producer of missiles and spacecraft for the Cold War arms race and space race. NATHAN KERNAN has written on art for Art in America, Art on Paper, Modern Painters, and various gallery and museum catalogues. He edited the Diary of James Schuyler, published by Black Sparrow Press in 1997, and is working on a biography of Schuyler. A chapbook, Lunch. A Poem was published by Pressed Wafer in 2007.